View on the book: An interesting collection of short stories, each with a unique twist. Recommended: Yes, it is an unusual book, light on the wallet and the stories are interesting to read. There are a few grammatical glitches, here and there, which do not detract from the stories itself and can be ignored. Rasa refers to emotions. The very foundation of Indian art, such as Bharatanatyam - a dance form is based on Nava-rasa or nine emotions (state of mind). Thus, when I spotted the title of the book - Navarasa by Lotus written by Rajiv, I was much intrigued and obviously thought that Lotus was the pen name of the author. (Lotus, incidentally is not the author's pen name and this is revealed towards the end of the book). 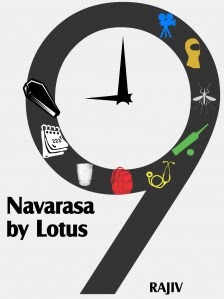 As the author aptly puts it: "Navarasa by Lotus" is a tale of 9 (nine) inter-linked stories. Each of which pays a tribute to a different rasa: humour, love, disgust, heroism, wonder, fury, horror, peace and compassion. These nine stories are interwoven with recurring characters and situations. An awesome idea indeed. It is a slim book of 164 pages, and you can read it at one go, actually you would want to read it at one go, as the stories are interlinked (but in a subtle manner) and as you turn the pages, you wonder, what will come next. The book begins with Rajan's story, he is fading movie star, caught in that space of time where reel-fights have given way to real-fights. Other characters in this book include: Jay who regards himself as a loser and a failure accidentally becomes a masked vigilante and prompts his 'hero' -- a friend whom he looks up to, to act like one, yet in the end saves this friend. Lucky is petrified of her dreams or are they a mirror image of her real innermost fears or a mirror image of future reality? . Children too are under tremendous stress these days and this is reflected in the story of Chintu facing up to those who torment him, including his English teacher (who takes pleasure in bestowing corporal punishments). Mutiny a story about mosquitoes who gang up with fellow creatures such as dogs, a cow, crows... to retaliate against their mass-killing by the human race but through non-violent measures, is a different story altogether. Then there is the story of the software pro - Rajiv (Rajiv also means Lotus -- is this the connection with the tag - By Lotus?) who discovers that his boss is a pharmacist and part of a secret mission which wants to create a better human race. The story moves on and morphs into science fiction with time travel thrown in for good measure, yes the human race has moved on beyond 2012 to a new world, a new future. My favourite story was the last one, called Redemption. 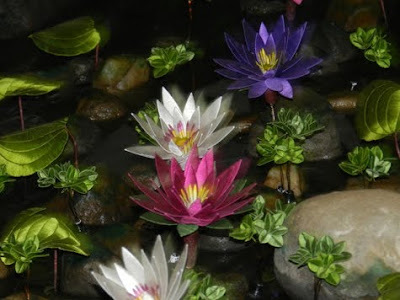 Anand seeks redemption by fulfilling one of the wishes of his deceased friend (Since I don't want to add a spoiler to the review, I will not reveal more).The Lotus, as we know it, is a beautiful flower that rises elegantly from above stagnant pond water. A heartfelt act of apologizing by fulfilling one of the wishes of the deceased friend, will surely ensure redemption. Navarasa by Lotus is a very interesting collection of short stories and worth a read. I would give full marks to this first time author for his ability to link each short story with the next. The twist at the end of each story ensures that you keep turning the pages right till the very end of the book. Note: This book was sent to me by the author for the purpose of review. I love short stories and am very interested in stories written by new Indian authors. Thus, I jumped at the opportunity to review this book and yes, I read the book in one sitting. Photograph: Thread garden at Ooty, shot by a friend of mine.